The Observing Deck atop McInnis served as the platform for nearly all of the College’s astronomy lab students from 1976-1996, 20 years. Twin 8” Celestron telescopes and a 17.5” diameter Dobsonian performed well, but 20 years of constant setting up and taking down took their toll on the students, equipment and lab assistants. We were also severely limited in the types of astronomical work that we could accomplish, especially regarding the possibility of any serious research. Suffice it to say that the Observatory is the culmination of a 20-year dream and an eight-year, $450,000 fundraising effort made possible by many people. Tom Ridington spearheaded the fundraising effort over all eight years. Earl Russell (on the Board of Directors of the College) was the architect/engineer, who took my ideas and made them reality. Rob Smith carefully scrutinized every last detail throughout the construction, and the result is the most up to date, state of the art astronomical observatory in the Delaware Valley. God is indeed good. I was on hand nearly every day during construction in the summer of 1996. Besides being mostly fun, this turned out to be crucial to the success of the facility because everyday details and questions came up that needed my input. The following is a brief pictorial of the summer’s construction. Check out the gallery to the left for images of the construction. God created the heavens and the earth. A few years later God blessed Eastern University with a beautiful observatory and here is the story of its humble beginning. 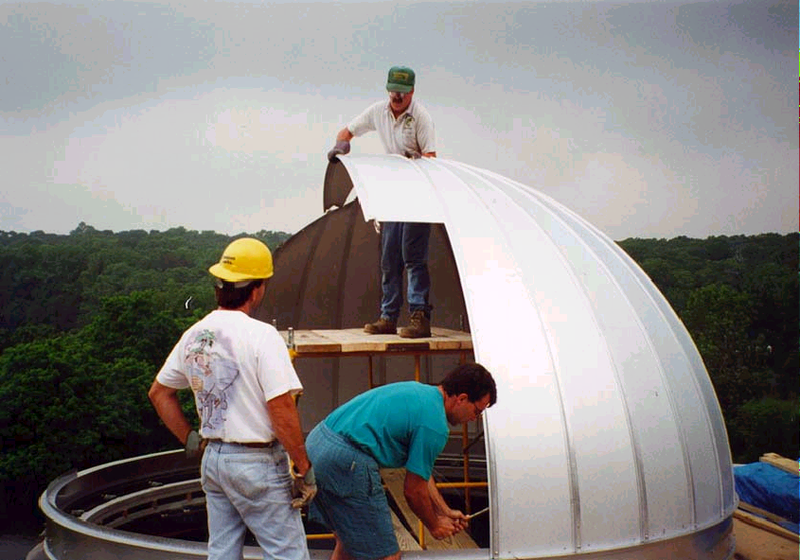 The Observatory consists of twin 14.5-foot diameter galvaluminum Ash Domes, able to rotate 360°. The shutters are designed to slide up behind the dome, with a lower shutter that louvers downward, allowing the observer to see from the horizon to the zenith. The domes are controllable not only from within the dome but also remotely from the Russell Control Room. The azimuth of the open shutter is automatically read out via digital sensors donated by Ken Goff of Performance Controls, also a member of the College’s Board of Directors. 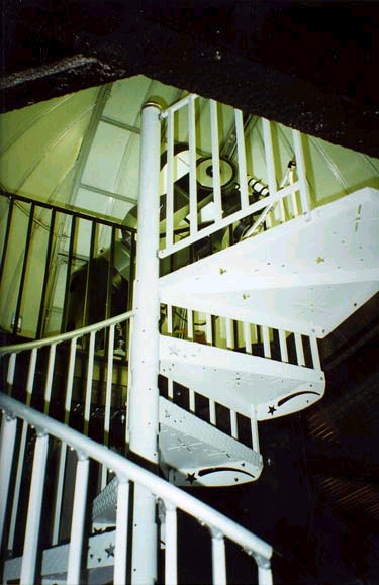 This allows observers in the Control Room to be able to align the dome to wherever the telescope is pointing without having to see either the telescope or the dome. This is critical because most of the serious observing and research is undertaken from the Control Room, not in the domes. The domes house 16” diameter Meade LX200 Schmidt-Cassegrain telescopes. These telescopes are fully computerized, allowing the user to automatically find 64,000 objects pre-stored in the telescopes’ computer. These telescopes have a fair number of auxiliary equipment that will be described below. Students can easily find and observe objects through a large array of professional quality eyepieces. They must observe and sketch a number of objects for their observing notebook. This “old-fashioned” astronomy is still the most rewarding aspect of the lab for many. The students cannot believe their first views of Jupiter and Saturn. The most frequent comment is “Is that really Saturn? It is especially meaningful when they later take CCD (Charge Coupled Device) pictures of these same objects, revealing incredible detail and structure that the eye just cannot resolve. The students understand fully why astronomers did not understand the true stellar nature of galaxies until 1930, those vast islands of hundreds of billions of stars, looking like wispy cotton candy even in the best photographs. The computer-controlled cameras are Santa Barbara Instrument Group’s top of the line CCD camera, the ST8. We have two of these coveted cameras that have the ability to self-guide the telescope during long time exposure, i.e., the camera watches the stars through the telescope during the exposure and constantly instructs the telescope on how to move to exactly keep the stars motionless on the camera chip. To gain some perspective on the exceptional capabilities of these kinds of digital camera, regular camera film is only 8% efficient in triggering chemical reactions when impacted by photons (light). CCD cameras register 60-85% of the incoming photons striking the CCD chip’s surface. Thus the efficiency of the telescope’s aperture is greatly increased by these phenomenal cameras, allowing smaller telescopes to outperform million dollar instruments of the 1970’s.